Many people call the Mission near San Francisco Mission Delores. Mission Delores real name is Mission San Francisco de Asis. Father Francisco Palou claimed the site in June 1776 and held an official dedication ceremony on October 9, 1776. The Mission was named for Saint Francis of Assisi and was the 6th Mission founded. The site chosen for the Mission was near a lagoon named Nuestra Senora de los Dolores. The Mission was built on the foggy San Francisco peninsula where the weather was often cold and damp. One important factor in locating a mission was being near a Native American village. 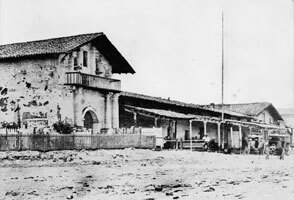 Mission Dolores was built on the site of the Chumashs Chutchui village. The Ohlone that the Mission was built for, like most of the other tribes in California, were nomadic. That means that they lived in one area for a time and would move their entire community to follow herds for food or when too much garbage piled up they would burn down the old ones and find another site to build their homes. Men hunted and fished to provide food while the women gathered acorns, wild herbs, roots, and berries to help feed their families. The Fathers followed a regular plan for creating the layout of the mission buildings. Right after blessing the site the Fathers and the soldiers would start building a small building to hold the religious ceremonies, called a Mass. They would encourage local Natives to help them. Many often did; they were fascinated by the tools and gifts that the Fathers had brought with them. The first buildings would be built of wood poles and brush. Eventually the buildings would be replaced by larger adobe brick or stone buildings. After a chapel or church was finished where the Fathers and Neophytes could hold Mass they would start building the Convento. The Convento was where the Fathers would live. Next would come workshops and the Monjerio. The Monjerio was where unmarried girls and women would live and be locked in at night. The Fathers didnt think that unmarried girls and women should live near single men. Eventually there would be enough buildings for four sides of a square or quadrangle. The Mission complexes werent perfect squares because the Fathers didnt have a way to measure distance other than walking off distances. Most Missions included a fountain. The fountain was used for washing, laundry, and water. The more fancy the fountain the more successful the Mission. Mission San Francisco de Asis chapel was finished in 1791. The adobe walls are four feet thick and may have been one of the reasons that the chapel was one of the buildings that was left standing after the 1906 San Francisco earthquake and fire. The Mission has survived several earthquakes including the �Loma Prieta earthquake in 1989. The buildings have been reinforced with steel to make them stronger. Those that lived at the Mission went by a strict schedule. The Fathers were used to this type of lifestyle, but the neophytes were not. The structure of Mission life was one of the reasons many Native Californians tried to leave. A French explorer, Jean Fran�ois de La P�rouse, visited Mission San Carlos is 1786 and wrote a detailed account of what he observed. Events at the Mission were signaled by the ringing of the Mission bells. Each day started around sunrise (about 6am). The Mission bells would ring to wake everyone and summon them to Mass and morning prayers. Prayer lasted for about an hour and then everyone would go to breakfast. Atole, a type of soup made from barley and other grains, would be served. Breakfast took about 45 minutes and then it was time for everyone to go to work. Life at Mission San Francisco de Asis was cold and damp. The weather was very poor and a number of the neophytes and fathers were often sick. Even with the poor weather the Mission was able to raise cattle, sheep, mules, and horses as well as several different crops including wheat, corn, beans, barley, peas and lentils, and had a fruit tree orchard. The Mission suffered through secularization as most of the other Missions did. In 1850 President James Buchanan returned some of the Mission lands to the Church. The Pueblo of Yerba Buena, eventually to become the city of San Francisco, started to grow toward the Mission and eventually made the Mission part of the citys boundaries. The Victorian-era Church was built next to the Mission and both buildings are in active use by the local Parish.